A Syrian Teen, Forced To Flee 'A Land Of Permanent Goodbyes' After her first book, journalist Atia Abawi was inspired to write a young adult novel about the Syrian refugee crisis. "It seems very dark, but it's a situation that happens all the time," she says. Atia Abawi is used to looking at war through the eyes of a journalist. She's made a career in news covering Iraq and Afghanistan — the latter being the country her own family fled in the early 1980s. Increasingly though, Abawi has turned to fiction. "It was a way for me as a journalist to go beyond those 700 words or that two-minute clip," she says. "To give insight in a way that I couldn't as a journalist, to give the full story, a depth that the reader could take in and find a way to empathize more with the people who are struggling." The people struggling in her novels are young — she writes for teens. 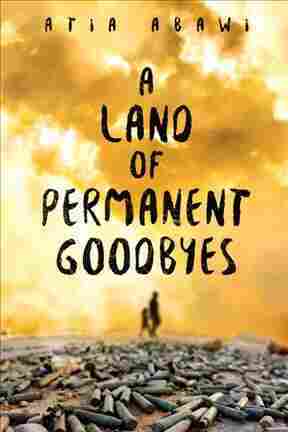 And the story behind her latest book, A Land Of Permanent Goodbyes, is drawn from a global crisis that's been dominating headlines the last few years: Refugees fleeing the war in Syria. Abawi researches her fiction like a journalist, interviewing real people, traveling to refugee camps and poring over shocking photographs. The book begins in an unnamed Syrian city with a teenage boy, Tareq, surrounded by his bustling, tight-knit family. It details Tareq's excruciating journey, leaving behind people and places he loves, almost from the very moment a bomb hits his family's home. Tareq was having a normal day with his family. His mom was cooking in the kitchen, his grandmother was enjoying a small glass of tea, his little brothers and sisters were playing and watching TV — just the typical day in their lives. And that typical day is destroyed by an airstrike. He's sent to the hospital where he does get some good news that his little sister is alive. But then a doctor takes him to a room and he sees his two 6-month-old little brothers dead on a gurney. And it seems very dark, but it's a situation that happens all the time, and really it's based on real characters, including those twins. I've seen pictures of the twins laying on the gurney, and it's the sad truth. I was researching a completely different book when I myself was captivated [with] what I was seeing on my own TV screen, when I was seeing those families who were making that first step out of Syria. I thought about my own parents, and what they went through and what they continue to really go through despite them leaving Afghanistan in 1981. It's not an issue of, "Oh, I want to leave for a better life." Yes, you want to leave for that better life, but you're also leaving behind your whole existence really. My mom was pregnant with me when they escaped [from the Soviet invasion in Afghanistan]. I was born a refugee in Germany in our first stop, and then we came to America when I was 1. And so when I was watching these refugees making their journey and I saw what they were going through, I knew that this was just their first step. And for Tareq, the character in my book, he goes to Turkey. He's a second-class citizen there. He's going to go to Europe. He's going to be a second-class citizen there. There are people who don't want him. There are people who fear him, despite him being the one who's really afraid. There's not just one refugee with one story. There are those who left with a lot of money. There are those who left dirt-poor from a village. There's not just one refugee with one story. There are those who left with a lot of money. There are those who left dirt-poor from a village. There are those who come from Syria, those who come from Afghanistan, those who come from Somalia or Sudan. But I did take the responsibility very seriously. In fact, I internalized it a lot. And it makes it much more difficult because you are shedding those tears as you're doing your research. ... You look at your child or your family and you're just so grateful for what you have. And then you're wondering why you have that, and they don't anymore. And then you also think about the fact that tomorrow this could be taken from us as well. But I did take it very seriously, and I kept in touch with some of the people that I interviewed, the ones that I could keep in touch with, because I could never go to Raqqa because it was under ISIS' control. I was directly in contact calling a Syrian from Raqqa on WhatsApp. I would send him my chapters, and he would tell me, "Well this seems a little unrealistic. It's more like this." And then I would tweak my story to whatever he told me. Luckily he was able to get out. He's in Europe right now. But it was something that I did take to heart. This story was edited by Shannon Rhoades, produced by Kevin Tidmarsh, and adapted for the Web by Sydnee Monday and Patrick Jarenwattananon.